New Eagle Scout Jack Romer. Jack Romer, the son of Sulyn and John Romer of Wilmington, was awarded the Boy Scouts of America (BSA) Eagle Scout rank on March 10. 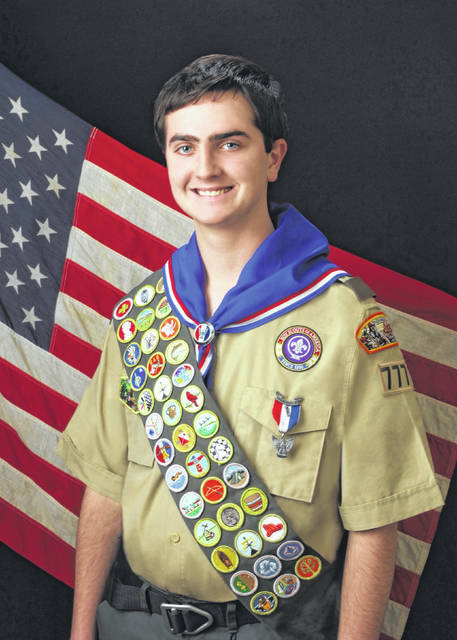 Jack, 18, is a member of Troop 777 sponsored by St. Columbkille Catholic Church in Wilmington. His 10-year journey to achieving Eagle Scout, the highest rank attainable in the BSA program, began as a Tiger Cub Scout in Wilmington. For his Eagle Scout Service Project, Jack worked with Naturalist Amanda Wolski at Cowan Lake State Park to design and build an outdoor pen for the box turtles that are residents of the Naturalist cabin. Outdoor care is important for the exercise, health, and nutrition of the turtles. The new enclosure allows the park’s volunteers and employees to keep the turtles outdoors with less safety risks for the animals. Scouts from Troop 777 along with friends and family built the project. Personal fundraising efforts over the last four years paid for the building supplies. While working on his Eagle Scouts rank, Jack earned 41 merit badges, attended six summer camps, and took part in the West Point Scout Camporee along with members of Troop 777 and Troop 155 of Clarksville. As a Boy Scout with Troop 777, Jack held positions of Senior Patrol Leader, Patrol Leader, and Assistant Patrol Leader, and he supported a wide range of service projects around the Wilmington area. Jack is a senior at Wilmington High School where he was a varsity tennis team member, head statistician for the WHS varsity basketball team for three years, member of the National Honor Society, and classroom tutor at Holmes Elementary School since the sixth grade. He plans to attend the The Ohio State University to earn a degree in Sports Management and Business Management.